The Scheduling tab lets you enter information such as contracted hours and payroll information. 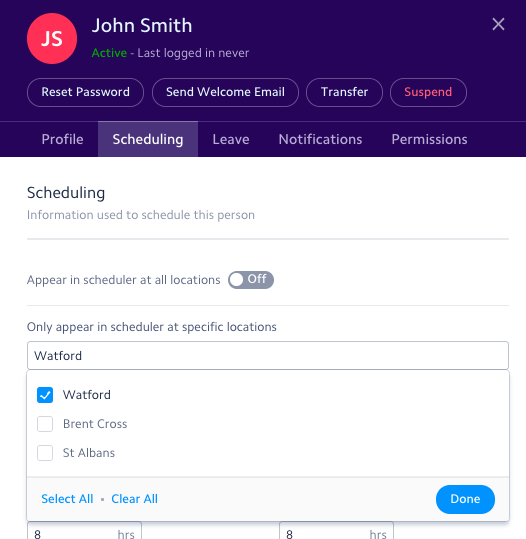 If you slide the toggle Appear in scheduler at all locations, the employee will appear in the rota of all the locations they're assigned to. If you slide it off, you'll be able to choose which location(s) schedulers this person should appear in. This is useful if they work in one shop but schedule for several of them. Enter the contracted hours and the maximum hours this person can work each week. 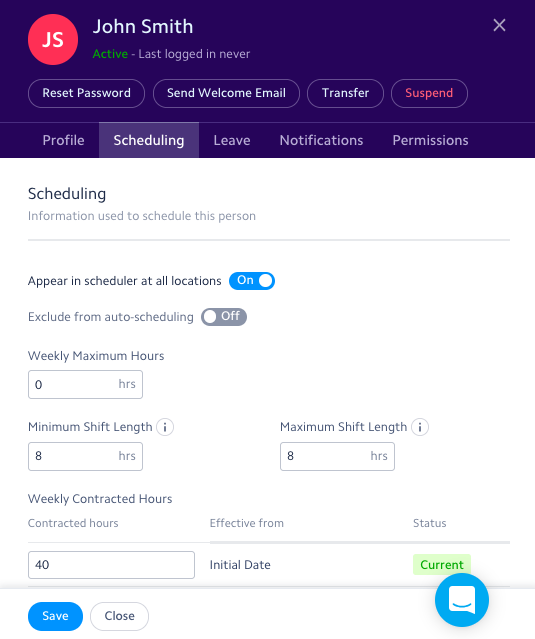 If you're using the auto-scheduler, also fill the minimum and maximum shift lengths in order to give the auto-scheduler boundaries for this person's shift length. You can also choose to exclude them from the auto-scheduler by sliding the toggle. Enter the wage of the person in the Payroll options box - you can either enter an hourly rate or an annual salary if the person is salaried. This section also gives you history of their previous salaries. Once you're finished, press Save and Close to save the information.